Paddle Yourself Around on a Kayak! Planning your next vacation and want to include a really memorable experience? If your passion is kayak tours & adventures, we have a number of options for you that are available in USA. The kayak tours & adventures activities shown below have been selected for their high quality and value. We offer a low price guarantee to ensure you get the best value. Book now before you arrive and guarantee your spot to avoid sellouts. While you're in port in Juneau, experience the tranquility of the Alaskan wilderness from a kayak! As you paddle the waterways in search of local fauna on the Tongass Wildlife Kayaking Adventure, keep your eyes peeled for humpback whales, seals and other marine life. After your cruise ship docks in Juneau, a 30-minute drive will bring you to a private beach near Amalga Harbor and Yankee Cove; you'll pass Mendenhall, Herbert and Eagle glaciers along the way. Keep your eyes on the surrounding rivers, peat bogs and spruce-hemlock trees for local wildlife including porcupine, deer, beavers and eagles. By the time your shore excursion ends, hopefully you’ll have seen an array of Alaskan wildlife. At the beach, your guide will help you get outfitted in quality gear before you slip away from the beach in a tandem kayak to begin your Tongass Wildlife Kayaking Adventure. This area is the perfect breeding ground for krill and phytoplankton due to the fresh water that pours into the coastline from the glaciers. The plankton-rich waters attract a myriad of wildlife looking for an easy meal. Humpback whales traveling through to Hawaii often spend the whole summer feeding in these waters and from time to time orcas can be spotted cruising the area, as well. Seals, porpoises, sea lions and many species of sea birds are also often seen. Rain or shine, this is quite simply the finest half-day kayak trip you will find. Certified guides lead an entertaining coast wilderness route that is limited to 12 participants. This is an easy to moderate adventure that requires no previous experience, making it perfect for beginners and families. You need only bring your camera and an appetite for adventure. Join the locals for a true Alaskan wildlife experience! We will ensure your timely return back to the ship in Juneau for this activity. If your ship is delayed and you are unable attend this activity, your money will be refunded. See our terms and conditions for full details. Experience the tranquility of the Alaskan wilderness as you paddle on the waterways in search of local fauna on a Tongass Wildlife Kayaking Adventure. A 30 minute drive from Juneau brings you to a private beach location near Amalga Harbor and Yankee Cove, passing Mendenhall, Herbert, and Eagle glaciers along the way. Keep your eyes on the surrounding rivers, peat bogs and spruce-hemlock trees for local wildlife including porcupine, deer, beavers and eagles. On arrival, you guide will help you get outfitted in good quality gear before you slip away from the beach in a tandem kayak to begin your Tongass Wildlife Kayaking Adventure. This area is the perfect breeding ground for krill and phytoplankton due to the fresh water which pours into the coastline from the glaciers. The plankton rich waters attract a myriad of wildlife looking for an easy meal. Humpback whales traveling through to Hawaii often spend the whole summer feeding in the waters and from time to time Orcas can be spotted cruising the area. Seals, porpoises, sea lions and many species of sea birds are also often seen. Rain or shine, this is quite simply the finest half-day kayak trip you will find. Certified guides lead an entertaining coast wilderness route that is limited to 12 participants. This is an easy to moderate adventure which requires no previous experience, making it perfect for beginners and families. You need only bring your camera and an appetite for adventure. Join the locals for a true Alaskan wildlife experience! Spend your time in port in Ketchikan paddling through the waters of the Pacific Ocean and discovering Alaska's Eagle Island. On this shore excursion, you'll have the opportunity to glimpse a vast array of wildlife, such as Alaskan starfish, bald eagles, humpback whales and orca whales. A perfect opportunity to explore Ketchikan's beautiful scenery awaits! When your cruise ship docks in Ketchikan, a minivan will provide transport to the majestic waterfront facility in Clover Pass. You'll receive a brief safety introduction before you receive your tandem kayak and enter the protected waters of Clover Pass. The tranquil waters offer the perfect opportunity for both novice and experienced kayakers to build confidence in their skills. Eagle Island is part of Tongass National Forest, which takes up most of southeastern Alaska and surrounds the Inside Passage. The forest offers splendid scenery and the perfect background to see local wildlife as you paddle around Eagle Island. Bald eagles soar overhead, seals swim and salmon jump into sight. If you're lucky, you may even spot humpback whales and orcas. No experience is necessary for this sea kayaking shore excursion from Ketchikan – just a thirst for Alaskan adventure! We will ensure your timely return back to the ship in Ketchikan for this activity. If your ship is delayed and you are unable attend this activity, your money will be refunded. See our terms and conditions for full details. While in Sitka, explore the area's natural beauty and abundant wildlife from the water! This 3-hour tour includes a sightseeing cruise out to a floating base camp, followed by 1.5 hours of kayaking through the magnificent waters of the Gulf of Alaska. During your tour, your professional guide will point out the native wildlife that Sitka is famous for, including bald eagles and harbor seals. From the water, you may even spot land mammals, including black-tailed deer and brown bears! Experience Alaska’s awe-inspiring beauty on this kayaking tour from Sitka. On this unforgettable wilderness adventure, meet your group at the Sitka downtown dock and suit up in quality rain gear and life jackets. Then, climb aboard a custom-built vessel for an exciting sightseeing tour on the Gulf of Alaska. Your captain will scan the sea for wildlife, including whales, and identify points of interest along the way. Head to the floating base camp, where you’ll receive a safety instruction from your knowledgeable guide on how to use the two-person kayaks. These stable yet maneuverable crafts let you enjoy the natural beauty of the protected bays and inlets near Sitka. Groups will be led by an experienced guide, who will show you expert paddling techniques. Enjoy a 1.5-hour kayaking trip around the area and learn about the surrounding marine environment. Spot colorful marine life, see an eagle swooping from the tree tops and admire the grandeur of the lush rainforest. You may even see brown bears, harbor seals or black-tailed deer! No prior kayaking experience is required and all ages are welcome. After kayaking, refuel with a hearty warm snack consisting of clam chowder, crackers and hot apple cider. Once docked at the Sitka port, you won't have to go far see this area's abundant natural beauty and wildlife! This 3-hour shore excursion starts right at the cruise port dock and includes a sightseeing cruise and then a 1.5-hour kayak tour through the magnificent waters of the Sitka Sound, part of the Gulf of Alaska. During your tour, spot some of the wildlife that Sitka is known for, including bald eagles and harbor seals. From the water, you may even see black-tailed deer and brown bears! While in port in Sitka, embark on an exciting kayak tour in Sitka, sure to be a memorable adventure! Meet your group dockside at the Sitka cruise port and prepare for your Alaskan experience. Suit up in quality rain gear and life jackets and climb aboard a fast, custom-built vessel for an exciting sightseeing tour on the Sitka Sound. Head to the floating base camp and listen as your captain points out native wildlife, including whales! Upon arrival, you’ll be instructed on how to use the two-person kayaks. These safe, stable and easy-to-maneuver crafts let you enjoy the beauty of the protected bays near Sitka. Follow your experienced guide while learning effective paddling techniques, and learn all about the surrounding marine life. Spend approximately 1.5 hours kayaking while taking in the magnificent scenery. Keep an eye out for colorful fish and other sea life, eagles, harbor seals, black-tailed deer or even brown bears! No prior kayaking experience is required and all ages are encouraged to participate on this tour. After kayaking, enjoy a hearty snack including clam chowder, crackers and hot apple cider. We will ensure your timely return to the Sitka port for this activity. In the rare event your ship has departed, we will arrange for transportation to the next port-of-call. If your ship is delayed and you are unable to attend this activity, your money will be refunded. See our terms and conditions for full details. This popular kayak tour will allow you to kayak the La Jolla sea caves and ecological reserve, which boasts an amazing array of scenery and wildlife you can't find anywhere else in San Diego. As you paddle alongside your expert naturalist/biologist guide, keep an eye out for sea lions, dolphins and even an orca! No experience is needed! Your knowledgable guide will help you learn the basics and tour you around one of the premier eco-tourist destinations in San Diego. After a brief paddle instruction and safety talk, you'll take your kayak down to the beach in La Jolla Shores and paddle to the La Jolla Sea Caves taking in the gorgeous views and watching for the abundant wildlife. You'll also go through the incredible rock formations and caves (if conditions permit), through the expansive kelp forests and wildlfie hot spots and cap it all off with a kayak surf ride back to the beach. You can see numerous types of sea birds and usually sea lions, seals and sometimes dolphins or even orcas! What to Expect: Be prepared to get wet! For safety reasons, the tour operator does not guarantee going into the caves on tours. Entrance to caves based on ocean conditions, safety and participants ability as determined by guide. This tour is recommended for ages 6 and up. Participants must be able to swim. Kayak out from La Jolla Shores and watch the magnificent whales as they migrate between Alaska and Baja, Mexico. The whales' migration path is such that they come close La Jolla Shores. By paddling about a mile off-shore, you can catch these incredible animals, plus other marine mammals such as seals, sea lions and dolphins. There is no better way to experience the whale migration than from a kayak. Pricing is based on single kayak for one passenger and tandem kayak for two passengers. This tour is recommended for ages 10 and up and all must be able to swim. Mission Bay is the largest aquatic park in the United States and is the ideal San Diego adventure experience for families. Glide through the calm waters and soak up the beach lifestyle as you explore with your expert instructors and tour guides. This 1.5-hour kayaking tour is great for first time kayakers. Bask in the sunshine and keep an eye out for sea lions and sea birds. Check out an array of wildlife including sea lions, seals, occasionally dolphins, a vast array of sea birds and a variety of fish on this 1.5-hour kayaking tour on Mission Bay. As you make your way through the rock gardens, keep a watch out for lobster, star fish, rays, leopard sharks and the brilliant Garibaldi fish. Mission Bay is a recreational paradise and the perfect spot for first time kayakers. This tour is recommended for ages 2 and up. Participants must be able to swim. Embark on a unique tour of California Wine Country! On this guided kayak tour, you can kayak in one of two beautiful places in Sonoma County. Choose either a kayak tour along the Russian River in Healdsburg or a kayak tour along the Jenner coastline. The tour guide will take you through the scenic route of your choice and point out native wildlife while you paddle leisurely through the calm waters. The tour includes one- or two-person kayaks, necessary equipment, safety lesson and lunch. After a short instruction and safety talk at Memorial Beach, your guide will launch you into the Russian River and share information about the local history of the Healdsburg area. As you paddle, spot local wildlife such as snowy egrets and blue herons, and enjoy the picturesque scenery and surrounding flora. The tour covers approximately 9 miles (14 km), and along the way, stop at a small riverside beach for a picnic lunch and a quick dip in the water. The kayak tour concludes at Wholer Bridge, one of the oldest bridges in the Russian River Valley, where a driver will drive you back to the original departure point. After a short instruction and safety talk in the small town of Jenner, on the Pacific coast, hop in the kayaks and begin the journey through the mouth of the Russian River. Be prepared to be greeted by beautiful surroundings – there are sandy beaches and cliffs on one side and rolling hills on the other. Stop for a picnic lunch at midday and enjoy the pristine view of the coast. Continue on to Penny Island, looking for local harbor seals along the way. Finally, make your way back to the launch spot to conclude the kayaking tour. Experience California Wine Country on a fun-filled day in the picturesque rolling hills of the Alexander Valley. First, you'll bike along country roads, stopping for wine tastings and enjoying a delicious picnic lunch. Then, hop in a kayak and paddle down the scenic Russian River. The adventure takes place in Alexander Valley, an award-winning region known for its cabernet sauvignon and merlot. Meet your guide at Ragle Park in Sonoma County, where you will be outfitted with a bike and gear and taught the rules of the road by your professional guide. Then you'll head out into Wine Country, cycling through 7 miles (11 km) of easy terrain at a leisurely pace. As you pedal, your guide will point out local landmarks and explain the history of the wine region. You will visit two to three wineries for a tasting of fine wines, and stop for a picnic lunch of fresh salad, bread, cheese, seasonal fruits and dessert. After lunch, you may even have time for a game of bocce ball! Then, you'll hop in your kayak and paddle down the Russian River. Along the scenic river route, keep an eye out for native wildlife and hold on when you kayak through some small rapids. Set out from Santa Barbara Harbor on a private kayak tour of the stunning Santa Barbara coastline. Take in views of Santa Barbara and the Santa Ynez Mountains, and keep your eyes peeled for seals and dolphins. Your expert guide will share information about Santa Barbara's top attractions and customize the speed of the ride to suit your needs. Choose between three different tours of varying duration and difficulty. Start your kayak tour at Santa Barbara Harbor or Leadbetter Beach, where you’ll be given a safety briefing and kayaking instruction if needed. Sunny days are the norm in this beautiful coastal city, but you’ll be provided with a wetsuit if it’s chilly. Then, climb into your stable, top-of-the-line kayak and set off on your journey along the lovely Santa Barbara coastline. Seeing this picturesque area from the water is the perfect way to appreciate its natural beauty. Take in amazing views of Santa Barbara -- nicknamed the ‘American Riviera’ -- and the rugged Santa Ynez Mountains as your informative guide shares facts about Santa Barbara's history and top sights. Ask all the questions you want on your private tour. Choose a morning departure if you'd like calmer waters; afternoon breezes require more rigorous paddling. Your guide will tailor the speed of your kayak trip to your preferences. Take your pick from three different routes of varying duration and difficulty -- all tours loop back to their departure point. 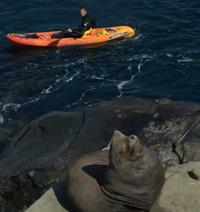 Depart from the harbor for this easy, 1.5-hour ride out to a buoy where local seals congregate. Enjoy wonderful views of Santa Barbara, ritzy Montecito and the surrounding mountains. This 2-mile (3.2-km) tour is a leisurely ride suitable for all levels. Start this 2-hour tour from Leadbetter beach and head north up the Santa Barbara coast. Glide over kelp forests and along the cliffs below Shoreline Park. Take in idyllic views of the Santa Ynez Mountains and the Channel Islands as you paddle up to three miles (4.8 km) on this easy to moderately difficult tour. Seals and dolphins are common along this route, so have your camera ready! Begin this moderately difficult, 2.5-hour tour from the harbor, covering some of the lovely Harbor Tour route. Then continue down the coast for an exceptional panorama of Santa Barbara and its neighboring cities. You will travel up to four miles (6.4 km) on this tour and on the way back, there may even be little waves breaking into the harbor that you can try to ride! Take a scenic 2-hour drive west of Miami for an unforgettable kayak eco-tour through the Florida Everglades’ mangrove tunnels. This area of the Everglades, where the forest grows over the tops of creeks, is brimming with abundant wildlife and vegetation. Kayak under the mangrove canopy with your expert naturalist guide and watch for herons, alligators, otters and more! Located just a 2-hour drive west of Miami lie the incredible Florida Everglades. On this 3.5-hour eco-tour, enjoy a kayak adventure through the lush mangrove tunnels and discover the area’s diverse ecosystem. Your tour will begin with a brief introduction on how to maneuver your single-person kayak (no experience required). Once you feel comfortable with the kayak, paddle down the lake and arrive at a narrow entryway, where the mangrove tunnels form a canopy approximately 10 feet (3 meters) overhead. This is one of the largest mangrove forests in North America! Follow your naturalist guide as you explore the vast and varied ecosystem and keep your eyes out for herons, egrets, ducks, spoonbills, alligators, otters and a variety of fish species. Along the way, your guide will provide an interesting, informative overview of the area and its incredible ecosystem. Boat, hike and kayak through the beautiful Florida Everglades on this exciting eco-adventure! Watch for dolphins, sea turtles, bald eagles and more as your naturalist guide leads you through the lush, diverse Everglades landscapes. With a maximum of six passengers on this small-group tour, you are sure to have an intimate and unique experience. Get the ultimate experience of the Florida Everglades on this fun, exciting eco-adventure by boat, kayak and foot! 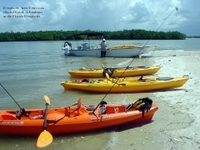 Your tour is led by an experienced naturalist who is certified by the national park and licensed by the US Coast Guard. Throughout your tour, your guide will teach you all about the history of the area, as well as the wildlife and diverse vegetation. Begin your tour with a boat ride through some of the most beautiful and remote areas of the Everglades National Park. Once you arrive at your destination, receive a brief safety instruction before getting into your kayak (no experience required) and exploring the area up close. Paddle your way to Barrier Island Beach, a remote beach seldom visited by others. Here, take a guided walking tour of the area and see the wrack lines, shallow tidal zones, dunes, uniquely adapted plants, mangrove swamps and many different invertebrate species. Your guide will tailor the tour according to the group’s interests and the day’s environmental conditions. You may encounter a wide array of the park’s wildlife including manatees, dolphins, sea turtles, bald eagles, ospreys, herons, egrets, roseate spoonbills and more! After your hike on the beach, get back into your kayak and paddle back to the boat for your return journey. Beautiful Key West is surrounded by the sparkling blue waters of the Gulf of Mexico, making it perfect for day of fun in the sun. On the Island T’ing adventure, you’ll sail on a large catamaran away from the bustle of Key West, kayak around a natural backcountry mangrove island and snorkel above a coral reef. Keep your eyes peeled for local wildlife like dolphins. A buffet lunch, with beer, wine, soft drinks and homemade sangria, is included. Spend a day out on the Gulf of Mexico, just off the shores of Key West. The Island T’ing adventure starts with a pleasant hour-long sail on a large catamaran through the sparkling waters of the Florida Keys, where the Atlantic Ocean meets the Gulf of Mexico. While you’re sailing, watch for local wildlife like dolphins, who sometimes swim alongside the boat. When you find a nice spot to stop at the coral reef, you can take part in any or all of the water activities. Enjoy a kayak tour around a natural backcountry mangrove island; snorkel above the reef; take a refreshing swim; or just relax on the boat and soak up the sun. A buffet lunch is included in the tour price, as well as beer, wine, soft drinks and homemade sangria. Along with your swimsuit and towel, it is recommended that you bring sunglasses and a hat to protect you from the Florida sun. Discover the natural beauty of Biscayne Bay by kayak or paddleboard. Paddle your way through the waters of Coconut Grove and be on the lookout for Florida’s wildlife -- manatees, sea turtles, manta rays and even dolphins are seen daily, so keep your eyes open. The harbor is protected from all weather conditions, and the calm waters make kayaking and paddleboarding fun and easy, no matter how little experience you have! 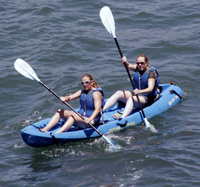 For the kayaks, choose between a single or upgrade to a tandem kayak if you're traveling in pairs. Please note: tandem kayak price displayed is per person. Just 15 minutes south of Downtown Miami is Coconut Grove, a neighborhood on Biscayne Bay that is the perfect location for paddleboarding or kayaking. Before setting out on the water, you will receive a safety briefing and instruction on how to use the equipment for your kayak or paddleboard. You’ll then have the rest of the time to explore Biscayne Bay on your own. You will be able to paddle around the small islands and take in the sights – maybe you’ll spot the manatees that are often seen swimming around the bay! Enjoy the fresh air while admiring the sights of Miami Beach’s bustling South Beach neighborhood on this bike tour. Follow your guide on an easy ride along the 'American Riviera,' stopping along the way to take photos and learn about Miami’s attractions and landmarks such as the Versace Mansion and the Art Deco District. Upgrade to enjoy a relaxing, scenic 2-hour kayak tour on Biscayne Bay after your bike tour! Your bike tour departs from South Beach, an exuberant neighborhood in Miami Beach. After hopping on your provided bike, follow your guide on an easy 5-mile (8-km) ride across sites like the Versace Mansion, Lincoln Road outdoor mall, and the Art Deco District to the peaceful edge of Biscayne Bay. Stop along the way to snap photos of Miami’s beautiful skyline and admire top Miami attractions. Follow your bike ride with a kayak tour to make your South Beach experience complete! After your morning bike tour, hop in a kayak at the Venetian Causeway with your guide and paddle along the calm, pristine waters of Biscayne Bay for 2 hours. No kayak experience is required, so first-time and experienced kayakers are welcome. Your guide will provide a safety overview of basic paddling techniques. Explore Weedon Island and other scenic St Petersburg locations on a kayak tour led by an experienced guide. After learning the basics of kayaking, explore beautiful waterways and lush ecosystems, learning about St Pete's native plant and wildlife along the way. This 2-hour tour is a fun way to connect with nature, enjoy some scenery, and get a workout! Meet at the white gazebo in North Straub Park and hop aboard your shuttle to head to the launch spot of Weedon Island. You’ll be outfitted with a kayak and all necessary equipment and given a brief safety training. Then, hop in your kayak and follow your guide on a 2-hour tour. Enjoy views of lush greenery as you navigate along the scenic waterways surrounding St Petersburg (known locally as St Pete). A highlight of your tour is exploring Weedon Island, a verdant archaeological area on the US National Register of Historic Places. Learn about native plants and animals from your guide while keeping an eye out for wildlife such as bottlenose dolphins, white herons, manatees and stingrays. This easy to moderate kayak tour is the perfect balance of serene exploration and physical challenge, letting you experience a side of St Petersburg you wouldn’t see on a traditional tour. After your kayak adventure, take the shuttle back to your original departure point. Enjoy an exciting day of kayaking below Hawaii's soaring cliffs and around its sea caves! Experience the picturesque beauty of the Big Island on this aquatic adventure – snorkel in historic Keauhou Bay; dive beneath the surface and discover an underwater world of coral landscapes and tropical fish; and feel your adrenaline pumping as you jump off a cliff into Keauhou Bay. Begin your fun-filled kayaking, snorkeling and cliff-jumping adventure at Keauhou Bay, the birthplace of Kamehameha the Great, a former Hawaiian king. Your local guide will provide you with the necessary equipment to start your outdoor adventure. Paddle into the calm and picturesque Keauhou Bay, where you'll receive more equipment and safety instruction. Kayak south away from Keauhou and head toward Kuamoo Bay. During your journey, you'll have the opportunity to encounter dolphins, manta rays and turtles swimming in the pristine water. On the way, admire the beautiful natural scenery, such as the soaring cliffs and blow holes. Kayak into Kuamoo Bay and explore the mysterious sea caves. Continue paddling along the coastline, where you will pass coral gardens and underwater lava tubes. Take a flashlight and explore the lava tubes in the cave. Next, you'll arrive at a cave in a protected cove, where you'll drop anchor and snorkel over the colorful coral reefs and explore the busy underwater world. Get up close to sea creatures and look for parrotfish, yellow tangs, eels, stingrays and green sea turtles. Finish your adventure with cliff-jumping! Climb up to the towering cliffs and jump into the deep water for an unforgettable experience. Relax and walk over to the tide pools to watch the eels hunt crabs. Bask in the warm sunshine and soak in the magnificent views. Then hop back in your kayak and head through the smooth water back to Keauhou Bay, where your tour ends. Choose from two tour departure times. The 4-hour morning tour includes kayaking, snorkeling and cliff-jumping. The 2-hour afternoon tour includes kayaking and cliff-jumping, but no snorkeling. Experience the thrill of seeing manta rays up close! Kayak and snorkel through the Big Island's pristine waters to see Hawaii’s playful manta rays at night. Watch these gentle giants feed on plankton, and then jump in for an unforgettable wildlife experience! Swim alongside some of the most amazing creatures of the ocean on a nighttime snorkeling adventure in Kona! Explore the world of elegant manta rays on this 1.5-hour evening tour. When you check in, you will be provided with all kayaking and snorkeling equipment, instruction and safety orientation. With your local guide, kayak along the Kona coast to the snorkeling spot of the night. Dive into the clear blue waters and enjoy the sight of these lovable manta rays swimming peacefully by you. Manta rays feed most actively at night when plankton rises toward the water's surface. Your guide will use powerful diving lights to attract plankton and enable you to get close to the rays. As you will be in a kayak, you will have the freedom during your 45 minutes in the water to move to different snorkeling spots to look for manta rays. When the tour is over, you will kayak back to the Keauhou Bay with your guide. Surround yourself with beautiful scenery, dolphins and the occasional humpback whale as you paddle a kayak in picturesque Kealakekua Bay! This narrated Big Island tour will take you through a marine life conservation district on your way to the Captain Cook Monument at Kaawaloa Point. 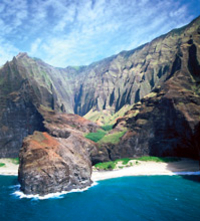 Along the way, your guide will highlight Hawaiian temples, burial caves, sea cliffs and much more. When you reach the monument, go for a hike, enjoy lunch or a snack and dive into the clear blue waters for an unforgettable snorkeling experience. Experience Kealakekua Bay’s beauty and wildlife on either a 6-hour or 3.5-hour kayaking and snorkeling tour. Your guided Big Island adventure starts at Napoopoo Landing, where you’ll hop in your kayak and paddle through the bay toward Captain Cook Monument at Kaawaloa Point. Along the way, catch glimpses of playful Hawaiian spinner dolphins while you soak up the tropical atmosphere. Keep your eyes out for the occasional humpback whale, too! As you paddle, your guide will tell you the historical background of the island and point out natural features like the Pali o Kapu o Keoua (towering sea cliffs), Napoopoo Beach and the remains of the village of Kaawaloa. When you reach Captain Cook Monument, leave your kayak on the shore and spend time exploring the great Hawaiian outdoors! On the 6-hour tour, you’ll have two hours of snorkeling time (one hour each in two separate locations) and one hour of hiking before refueling with lunch at the monument. The 3.5-hour abbreviated tour includes the same, but with only one hour of snorkeling and a quick snack instead of a lunch break. Both options end with you and your guide kayaking back to Napoopoo Landing. During your time on Kauai, enjoy a three-hour guided kayak and snorkel tour along the picturesque Hanalei River and in Hanalei Bay, which is home to the beautiful Bay Reef Lagoon. Admire the dramatic Makana Peak (Bali Hai) and get up close to tropical reef fish. As you kayak along the river, you’ll be surrounded by lush trees and diverse wildlife. Learn about the flora and fauna of the surrounding area from your naturalist guide, and enjoy a snorkel in the turquoise waters of the lagoon. On this three-hour guided tour on Kauai, enjoy the great Hawaiian outdoors as you kayak along the scenic Hanalei River towards Hanalei Bay where you then snorkel in Bay Reef Lagoon. Take in the spectacular views of Makana Peak (Bali Hai) and learn about the fire-throwing ceremonies associated with the mountain from your guide. 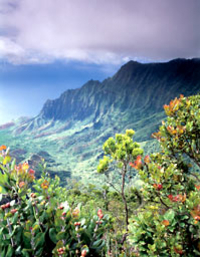 You’ll also admire the same gorgeous panoramas seen in the 1958 movie South Pacific, which was filmed on Kauai. Jump in your double kayak and paddle with your partner down the Hanalei River toward the scenic Hanalei Bay, home to the snorkeler's paradise -- Bay Reef Lagoon. Drift past taro fields and tall grasses that dance with the wind. Bask in the warm sunshine and enjoy the tranquil atmosphere. After paddling for 45 minutes, arrive on shore and enjoy a complimentary snack while you take a break on the beautiful white-sand beach. Then don your provided snorkeling gear and follow your guide out into the lagoon, where you’ll discover colorful reefs and fish. Keep an eye out for Hawaiian sea turtles! If you’re feeling adventurous, grab a surf kayak and paddle the gentle waves of Hanalei Bay. This perfectly shaped crescent bay is one of Hawaii’s most scenic, and it affords a perfect view of Makana Peak. Finish your tour by kayaking back to your starting point, from where you’ll ride with your group back to the tour departure location. For a fun kayaking Kauai activity, paddle tandem kayaks along the Hule'ia River and travel deep into the heart of the Kauai island jungle. Then, go Kauai hiking on a 3/4-mile (1.2km) trek up the valley to an enchanting area of waterfalls and swimming holes. On the way back, be picked up in a twin-hulled powered Hawaiian canoe for the return trip! On this 2 mile (3.2km) kayaking Kauai adventure, you'll travel through the Hule'ia National Wildlife Refuge, a place for the preservation of endangered Hawaiian water birds. You'll paddle past the living archaeological site of Alekoko (Menehune) Fishpond, and get a taste of the ancient people's fishing and aquaculture methods that are still utilized today. The backdrop is the magnificent Haupu Mountain Range, a dramatic and majestic 2000' (600 meter) shield volcano that looms over the river. The destination is a series of 3 pool-drop waterfalls with a swimming hole known as Hidden Falls. The area is steeped in legend and your guides will tell you exciting stories about the supernatural inhabitants who resided in the valley long ago. Hule'ia has been the site of filming for a wide range of major motion pictures including Raiders of the Lost Ark, Jurassic Park and its sequel, Lost World. You'll leave your kayaks behind and set out on a 1.5 mile (2.4km) round trip guided Kauai hiking nature walk through a pristine tropical rain forest containing many different communities of plants, birds and aquatic life. You'll stop along the way at swimming holes with rope swings before reaching Hidden Valley Falls, a captivating series of pool-drop waterfalls cascading over black lava rock. Here you'll have some snacks and cold drinks while enjoying the scenery before heading back down to the river for a fun trip back in a double-hulled powered canoe. It's cheating, but who cares? Restrictions: You must be able to walk 1.5 miles (2.4km) & kayak 60-90 minutes. This 7-mile (11km) kayak tour is a day packed full of fun, excitement and adventure. Savor the magnificent views, breathtaking scenery, and hidden beaches of Kauai's pristine South Shore. You may catch a glimpse of some spinner dolphins, sea turtles, seals and even humpback whales! 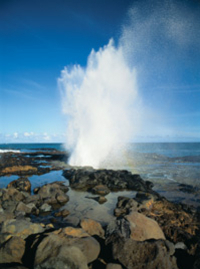 After launching from Kukui'ula Small Boat Harbor, you'll pass the famous Spouting Horn, a remarkable salt-water blowhole. After about 45 minutes, you'll surf your kayaks up on the beach at Lawa'i Kai, the exquisitely beautiful site of Queen Emma's Summer Home. Take a stroll on the beach and enjoy a hot cup of coffee and delicious muffins. You'll continue downwind, past the white sand beaches, barrier reefs, and volcanic craters of Palama's Point. As you paddle, you'll be hoping to see interesting marine life, such as the spinner dolphin or endangered sea turtle, both common in this area. During the months of November through April, you also run the chance of getting a glimpse of migratory humpback whales. After 7 miles (11km) of paddling, you'll be ready for lunch. You'll land at Wahi'awa, a protected bay, to relax, eat, and explore. You'll have the opportunity to comb the ¼ mile (0.4km) crescent-shaped sandy paradise, play in the water and snorkel the fringes of the bay. Meanwhile, your guide will lay out a tasty picnic lunch with a scrumptious brownie that may inspire an afternoon nap! Around mid-afternoon after another brief paddle, your driver will arrive to whisk you away on your return to the Poipu resort area. If you like excitement and adrenaline, then this is the one for you! This 15-mile (25km) kayak tour to the Na Pali Coast is typically carried out on heavy Hawaiian waters. It is one adventure that will definitely push you to the limit! Paddle past the famed Na Pali sea caves, Kauai's lush valleys and beaches cradled in the jungle. If you're up for a rewarding challenge, book now! This tour takes place on one of the most beautiful and remote shorelines in the world. The tour begins in Poipu, where you ride together in a 15 passenger van to the launch site in Haena. After paddling for about an hour, you'll come upon the famed sea caves of Na Pali, entering if sea conditions permit. You'll raft up your kayaks for a mid-morning juice and snacks break! You'll paddle a total of 11 miles (17km) in the morning, reaching Milolii, your first landing. Here, you'll enjoy lunch and explore the site of an ancient Hawaiian fishing community. Typically, you'll arrive at Milolii between 1 and 2 pm, so the morning is long! After lunch, you have a 4 mile (6.5km) paddle in usually calm waters to Polihale, where the van will be waiting for you. When you return to the Poipu store, you'll have circumnavigated the entire island! A Friendly Reality Check: this is a very long, somewhat strenuous paddle in typically heavy seas. Don't sign up unless you are up for a good workout and maybe a challenge. While this tour is best enjoyed by people who are physically fit and have some basic paddling experience, you may join us as a first time kayaker if you consider yourself to be athletically inclined and quick to learn new sports. Of course, this trip is not for non-swimmers. Warning: If you are prone to severe seasickness this trip is not for you. Enjoy an idyllic kayaking and hiking adventure on Kauai’s Wailua River. Paddle down the tranquil river and admire the lush jungle landscapes on shore. Your guide will lead you on a hike to a remote waterfall, where you can soak in the splendor of this peaceful and picturesque spot. Go for a swim in the pool and the streams that lead from the waterfall before heading back to your starting point. A deli lunch is also included. Explore the east side of Kauai as you kayak down the Wailua River, Kauai’s only navigable river for boats larger than kayaks. This 20-mile-long (32-km) river once wove through seven different ancient temples and is considered one of Hawaii’s two most sacred places. As you paddle down the river with your partner in a double kayak, take in views of the expansive, untamed landscape. After kayaking for 45 minutes, hop out of your kayak and follow your guide on a 1-mile (1.6-km) hike through the dense forest to a remote, 200-foot (60-meter) waterfall surrounded by flowers, brooks and ferns. Stand in awe as you watch the water cascade down into a pool, and cool off by taking a dip in the water! You are then picked up at Hanalei Bay and driven back to your start location. Go kayak paddling and snorkeling in the pristine waters of Maui's beautiful West Shore. This is a convenient snorkeling tour if you're staying in a west-side hotel, and it's great for all levels of paddlers. Maui's magnificent West Shore is celebrated for its shallow calm water - a delight for paddlers and snorkeling. While paddling, enjoy the astounding West Shore scenery, including the Ukumehame Valley. You will also have the chance to go snorkeling at several prime spots. As you glide over colorful reefs you'll experience a variety of marine life, including turtles. Take a leisurely paddle on the southern shore of the island in Makena Bay, past Little Beach and Big Beach out towards LaPerouse. You will have ample opportunities for snorkeling over colorful reefs with green sea turtles and a variety of colorful marine life. Don't be surprised if you spot dolphins or during the season, possibly encounter humpback whales. This is a great paddling and snorkeling adventure for all ages and abilities, great scenery, exciting marine life and tons of fun. For individuals without paddling experience our guides will provide you beachside paddling instruction, assist you with your launch and accompany you for the duration providing assistance where needed. Experience the best of both worlds with a combined Maui kayaking, snorkeling and hiking tour! You'll kayak and snorkel along the beautiful Makena coastline, then take a culture and nature hike into Old Hawaii. This tour is an absolute must whilst in Maui! Your Maui snorkeling tour begins with an early-morning kayak tour along the picturesque Makena coastline. As you paddle along the coast, the tour stops at favorite spots to snorkel and swim with giant green sea turtles. After 2.5 hours enjoying Maui's ocean beauty, the hike into Old Hawaii takes you to the place where the last lava flowed on Maui 200 years ago. Guided by an expert in Hawaiian culture and nature, you'll pass through the ruins of ancient Hawaiian sites. The Maui South Shore Kayak and Snorkel Tour combines an enjoyable lengthy paddle along the beautiful Makena coastline with a snorkeling adventure of a lifetime! Kayaking Maui South Shore's beautiful reef reveals multi-colored tropical fish and friendly turtles. A few snorkel stops, lunch on a sandy beach and an easy paddle back sums up this great family-friendly Maui kayaking adventure. The morning sun provides the energy and inspiration for an impressive day on the water as you paddle in South Maui's early morning calm waters. The early start will get you to all the best snorkeling spots first. This Maui kayaking adventure has something for everyone, including a hearty paddle of 4.5 miles (7.2 km), snorkeling, and scenic views. You'll snorkel in several sites along the way, all with colorful corals, vibrant reef systems and of course many green sea turtles. Paddling distance is approx. 4.5 miles (7.2km). Go Maui kayaking with a view! This kayaking Maui trip takes you cruising along the stunning sea cliff shore off the Pali where you'll be treated to some of Maui's most scenic coastline and exceptional snorkeling. Lunch is served along the way on a remote beach on this Maui kayaking adventure. Visiting remote snorkeling sites, the kayaking Maui trip offers truly fantastic views of the cliffs and shoreline in an area rarely seen by visitors. It is during the round trip towards the lighthouse that you'll stop and snorkel in a couple of great spots. Explore the tropical marine life and fantastic coral reefs. Enjoy a shoreline deli-style lunch while gazing at the picturesque sights of the island. The Maui kayaking continues along the scenic shoreline where sharp cliffs surrounded by stunning reefs lead into the waters. Paddling distance is approx. 5.5 miles. This fun and educational Maui kayaking tour starts at Makena Landing and paddles around the bay area. The calm, clear ocean is perfect for various water activities including swimming, snorkeling and animal watching. Float next to peaceful turtles and admire the stunning tropical underwater world. Leave all your worries behind and join this unique Hawaiian experience. This kayaking Maui trip is planned as a leisurely paddle around Makena Bay, available to all ability levels and ages 5 and up. Whether it's your first time on a kayak or if you're an experienced paddler, this Hawaiian adventure is a wonderful experience. Highlights include snorkeling with the endangered green sea turtle and wonderful views of Haleakala. Paddling distance is approx. 2.5 miles (4km). Spend half a day indulging in true Hawaiian water fun! Float next to peaceful turtles, admire the stunning tropical underwater world and take some fun surf lessons! Leave all worries behind and join this unique Hawaiian experience today! The kayaking tour is planned as a leisurely paddle around Makena Bay available to all ability levels and ages 5 and up. Whether it's your first time on a kayak or if you're an experienced paddler, this Hawaiian adventure is a wonderful experience. Kayaking highlights include snorkeling with the endangered green sea turtle and wonderful views of Haleakala. Surf instructions will get you riding the waves and enjoying surfing to make the most of your water time. Surfing is one of the most enjoyable ways to release high energy fun in the water. Easy to use, safe and fun soft top equipment provides each guest with the boards specific to their size. Each guest is welcome and provided rash guards and booties for their protection. Your instructors will provide the beach basics on shore including surf etiquette, safety and the rules of the wave to get everyone off on the right foot. After your lesson, you will have acquired the basics and can continue to develop your new found skills. We take care of the equipment, so all you have to bring is your spirit, energy, swimwear and sunscreen. All lessons take less than 2 hours and you'll spend some time on the beach doing a dry run before getting wet. Remember to bring your camera as it's likely you'll want some proof of your surfing day! Spend a day at gorgeous Kailua Bay on our Hawaiian kayaking adventure! Warm tropical water, the option of a self-guided or guided tour, roundtrip transportation from Waikiki & lunch make for the perfect day in paradise! Let our friendly driver pick you up from Waikiki for your all day fun in the sun aboard our air-conditioned minibus for the short trip to Kailua Bay! When you arrive, we'll outfit you with all the necessary equipment and provide you with a brief safety and instruction session. Choose between a guided tour or a self-guided tour. Paddle out to Popo'ia Island, a protected seabird sanctuary. As we head out, keep your eyes open for Honu, green sea turtles. Continue to Lanikai Beach, one of the top ten beaches in the world, for snorkeling, sightseeing and excellent photo opportunities. Then, it's off to Moku'lua, where we will land on a protected bird sanctuary for lunch and time to explore the island. Learn about the many creatures that call this place home – including green sea turtles, rock crabs & wedge-tailed shearwaters. If you choose the self-guided option, you will be provided with an extensive video briefing and instructions from experienced staff that will prepare you for an unforgettable day at Kailua Bay. Experience the remote and breathtaking beauty of an Oahu kayak adventure along the scenic windward coast of Kualoa, one of the most historically significant places on Oahu. This Oahu kayaking, hiking and snorkeling excursion combines the scenic backdrop of the lush Hakipuu Valley and the majestic volcanic Koolau Mountain ridge with the tranquil cobalt and turquoise ocean waters of Kaneohe Bay. Your Oahu hiking adventure begins with a short hike to a scenic overlook at the entrance to Hakipuu Valley. Here you will have the chance to capture an aerial perspective of the breathtakingly beautiful landscape, from its forested valleys to its inviting ocean reef waters. From this point on, your day will continue to unfold with one unforgettable highlight after another. Once completing your instruction for your Oahu kayak adventure, you’ll paddle along the tranquil and glassy waters of Kaneohe Bay. Due to the protected reef surrounding the area, this is one of the safest places for kayaking on Oahu. Your journey by kayak along Kualoa, listed on the National Register of Historical Places, takes you past Mokoli'i Island to the 800-year old Molii fishpond (one of the last ancient Hawaiian fishponds). This rock-walled enclosure was hand-built by ancient Hawaiians to maintain a ready supply of live ocean fish. As part of the privately- owned Kualoa Ranch, you will have the rare opportunity to experience an ancient Hawaiian treasure that most visitors to Oahu never get to see. As your kayak glides along the tranquil coast line of Kaneoohe Bay, your adventure includes an exclusive visit to Oahu’s hidden gem known as "Secret Island". This secluded beach in the country becomes your playground for relaxation, enjoyment and a picnic lunch. Whether you want to relax in a hammock, take a stroll around the island, or return to the ocean for a quick canoe ride, you’re certain not to want to leave.